There’s nothing quite like the VIP experience! Gourmet food, premium viewing, private artist performances, private tent-covered hospitality lounges and more are all included in Country Jam’s VIP packages. Your VIP package includes a 4-day VIP admission to the festival, along with premium seating in front of the main stage; access to the VIP hospitality village with an air-conditioned tent, shaded areas and flushable restrooms; complimentary a la carte food, beer, water and soda all day, and free hard liquor after 6:00 PM; free catered dinner each night from 5:00 to 8:00 PM; and the ability to purchase a VIP campsite. Q: What does a VIP Ticket include? Assigned seat in Sections 1-5 (all ages require a ticket in this location). 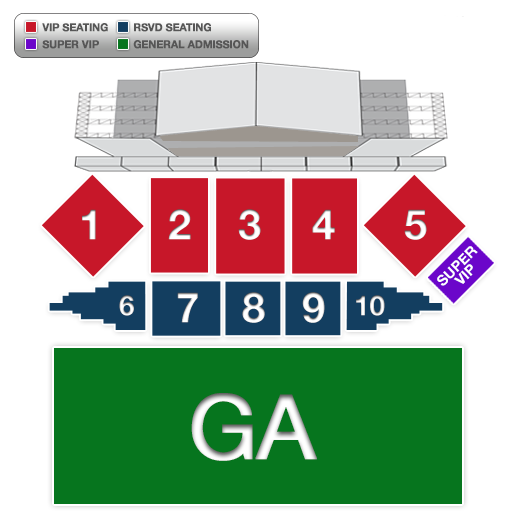 Click here for the seating map. Access into VIP Hospitality area with air-conditioned tent, complimentary beer, soda, water, and a la cart food. Hard liquor is free after 6:00 PM. Q: What does a Super VIP ticket include? Q: Is parking included with a VIP ticket? Yes, parking is included with your VIP ticket. Simply show your VIP wristband at the VIP Parking entrance and you’ll be able to park. Q: Is Camp Access included with VIP tickets? Camp Access is not included with VIP tickets, but it is included with Super VIP tickets. Q: Can I upgrade my General Admission tickets to VIP? Yep! Give us a call at 855-821-9210 and we’ll help you upgrade. Upgrades are based on availability and are subject to pricing at current market value. Q: Does having VIP tickets include access to the Country Club? No, you must purchase a separate pass for the Country Club. Q: Do kids need tickets for VIP? Yes, all ages require tickets in the VIP area.